Moving the Needle: Justin Turner’s errant throw costs the Mets the game, -.464 WPA. The Mets held a 3-2 lead heading into the ninth inning last night, but Jason Isringhausen ran into a bit of trouble. With one out he loaded up the bases, bringing pinch-hitter Bryan Petersen to the plate. He grounded one right to Turner at second, who, seeing that John Buck had frozen in his tracks, made a quick throw to first. Why he didn’t go to second I’m not sure, because a force double play was the only way to ensure that the runner from third didn’t score. Plus, with Buck frozen it was an easy get, so they’d at least prevent another runner from reaching scoring position, even if they didn’t turn two. But throwing to first was a folly in the first place, since it ensured the tying run would score. Turner did the Marlins one better by throwing it away, allowing the go-ahead run to score as well. 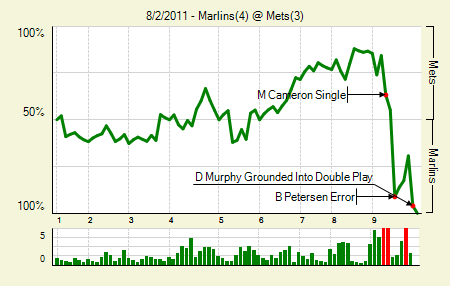 Chris Capuano: 6 IP, 4 H, 2 R, 2 BB, 5 K. It wasn’t the most pristine start, but it was almost good enough for a Mets win. Omar Infante: 3 for 5, 2 HR. Yes, yes, that’s more homers in one game than he’d hit all season. 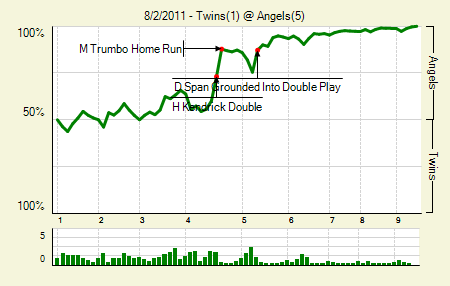 Moving the Needle: Mark Trumbo’s three-run shot breaks a tie in the fourth, +.147 WPA. After trading runs with the Twins the previous two half innings, the Angels jumped out to a big lead in the fourth when Trumbo launched an absolute bomb out to the rocks in center field. The homer put them ahead 4-1, a lead they’d hold easily the rest of the way. Ervin Santana: 9 IP, 8 H, 1 R, 2 BB, 7 K. That’s his second straight complete game, though he allowed eight more hits in this one than last time. He hasn’t allowed more than four runs in a start since June 10th (nine starts). Peter Bourjos: 2 for 3, 1 2B. His last 10 starts have been either multi-hit games or no-hit games. 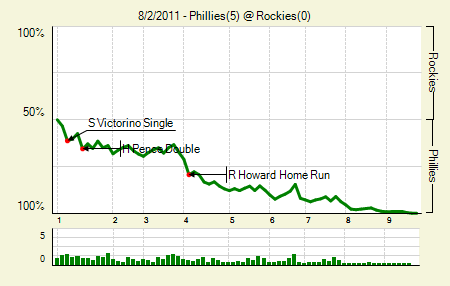 Moving the Needle: Ryan Howard’s bomb opens up a bigger Phillies lead, +.082 WPA. The Phillies jumped out to an early lead in the first, scoring on a ground out and a double. 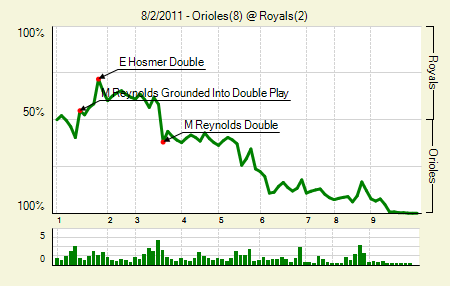 They then picked up another pair in the fourth, when Howard led off with a homer, a long shot to right field. Howard homered later in the game, too, his 23rd of the season, though only his second multi-homer game. Kyle Kendrick: 8 IP, 4 H, 0 R, 2 BB, 7 K. Looks like he’s getting some residual ace-ness from his rotation mates. Hunter Pence: 2 for 3, 2 2B, 1 BB. He’s 5 for 17 with three doubles since the trade. 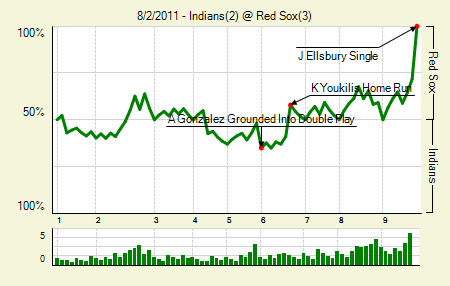 Moving the Needle: Jacoby Ellsbury singles home the winning run in the ninth, +.283 WPA. Tied 2-2 in the bottom of the ninth, the Red Sox picked up a pair of one-out singles to put the winning run in scoring position. That brought up Ellsbury, who is having quite the memorable year. He lined one back up the middle, which put the winning play in motion. Jarrod Saltalamacchia, pinch running for Jason Varitek, rounded third and slid safely into home, though a good throw would have gotten him easily. Josh Beckett: 6 IP, 6 H, 2 R, 0 BB, 7 K. He allowed two solo homers, but that’s it. David Huff: 5 IP, 3 H, 1 R, 2 BB, 6 K. Normally a pitcher going five wouldn’t make this, but considering it’s Huff against the Red Sox, I think it gets a little special attention. 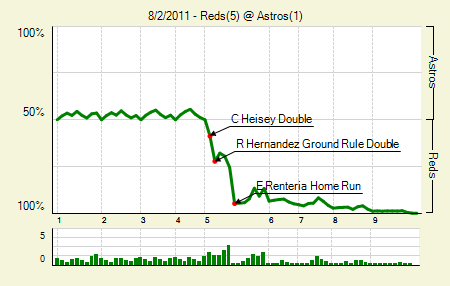 Moving the Needle: Edgar Reneria’s grand slam puts the Reds up huge, +.193 WPA. All of the Reds scoring took place in the fifth, and they slugged their way to those five runs. It started with back-to-back doubles, and ended when Renteria put one into the Crawford boxes. At 5-0, the Reds didn’t have to worry much from then on. Homer Bailey: 8 IP, 5 H, 1 R, 3 BB, 4 K. He also uncorked two wild pitches. This was his longest start of the year, and a nice bounce back after he allowed nine in four innings last time out. Chris Heisey: 2 for 4, 1 2B. Getting him more playing time was one good reason for last week’s trade of Jonny Gomes. Moving the Needle: Mark Teixeira costs the Yankees before he powers them, -.101 WPA. The Yankees were onto John Danks from the start. Derek Jeter led off with a single, and then Curtis Granderson walked. That brought up Teixeira, who hit a soft liner up the middle. The Sox had him played perfectly, leading to an easy double play. But Robinson Cano followed that up with an RBI double, and a homer the next inning gave the Yanks a 2-0 lead. 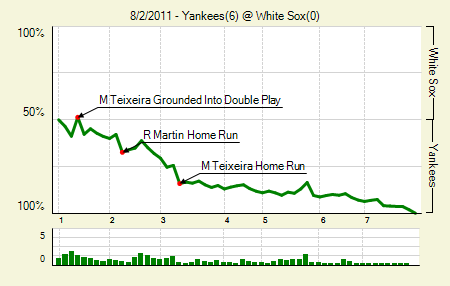 Teixeira later homered twice, his 30th and 31st of the season, putting him one behind the big league lead. Derek Jeter: 2 for 4, 1 2B. Since coming back from the DL he’s hitting .301/.353/.462. Not exactly vintage Jeter, but a step above the .260/.324/.324 he hit before the DL stint. Phil Hughes: 6 IP, 3 H, 0 R, 0 BB, 4 K. After his disastrous start to the season this is encouraging for Hughes. His fastball touched 95, which is something that has been absent all season. He threw only 65 pitches in those six innings, but rains halted his chances to go further. 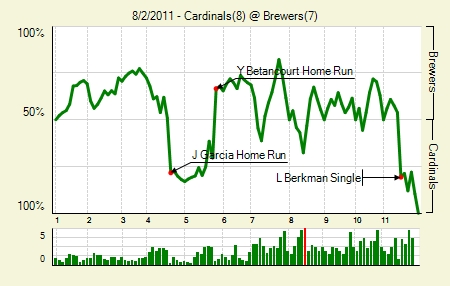 Moving the Needle: Yuniesky Betancourt’s three-run shot puts Milwaukee on top, +370 WPA. The matchup appeared tantalizing, as Shaun Marcum and Jaime Garcia did battle. But they both tanked, allowing a combined 13 runs in the first five innings. Garcia allowed seven, the last three of which came when Betancourt got a hold of an inside pitch and drove it out to left-center. The homer gave the Brewers a 7-6 lead. The Cardinals came back, though, scoring on a bases-loaded double play to tie, and then plating a two-out run in the 11th to win. Prince Fielder: 2 for 4, 1 2B, 1 BB. Apparently Tony LaRussa ordered Jason Motte to hit Ryan Braun to lead off the seventh, just after the Cardinals had tied the game. Fielder’s walk came after that, and the Brewers ended up loading the bases with none out. It was the perfect revenge for some questionable head hunting. Of course, LaRussa got the last laugh when the Brewers failed to score. Matt Holliday: 2 for 5, 1 HR, 1 BB. He drove in three officially, though it was his double play ball that tied the game. So four runs scored based on things he did. 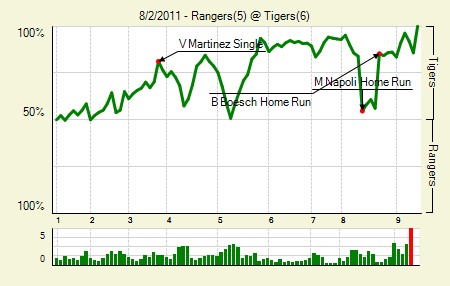 Moving the Needle: Mike Napoli’s two run homer ties the game in the eighth, +.293 WPA. The Tigers led 5-2 heading into the eight, and they trotted out their setup man, Joaquin Benoit, to hold the fort. He failed at his task. A pair of homers, the first to Nelson Cruz and the second to Napoli, brought the Rangers back to a 5-5 tie. The big flies allowed by Benoit highlights his disappointing year, in which he already has nine meltdowns (he had six all of last year). Thankfully for the Tigers, the Rangers new setup man, Mike Adams, also served up a bomb, which gave the Tigers the lead and eventually the game. Alex Avila: 2 for 3, 1 HR, 1 BB. He drove in three. It’s hard to understate just how much he’s meant to this Tigers lineup. There has to be a point where he starts hitting higher in the order, right? Brennan Boesch: 3 for 4, 1 HR, 1 BB. His homer off Adams won the game. 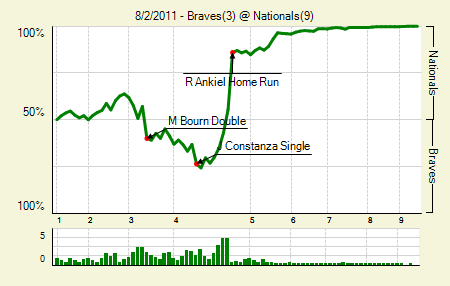 Moving the Needle: Rick Ankiel puts the Nats ahead with a grand slam, +.306 WPA. After falling behind early the Braves crossed a few runs in the third and fourth to take a 3-1 lead. But the Nats would strike big in the bottom of the fourth. With the bases loaded and one out pitcher John Lannan grounded one to first. Freddie Freeman fired home, but it was slightly offline and the runner scored. The next batter, Ankiel, appeared to have left his feet as he walloped a grand slam to center, putting the Nats up 6-3. John Lannan: 6.2 IP, 9 H, 3 R, 1 BB, 8 K. Normally this is not notable, but it is for Lannan. The last time he struck out eight in a start was April 17th, 2009. His career, high, 11, came exactly a year prior to that. Ian Desmond: 2 for 3, 1 HR. He hit his third homer of the season on April 28th, and only hit his fourth last night. Moving the Needle: Mark Reynolds doubles home a pair, +.202 WPA. Reynolds got busy in this game, racking up three hits that included a late-innings homer and an early-innings double. The double packed the most punch, as it drove home a pair to give the Orioles a 2-1 lead. They’d slowly build on that before rallying for four in the ninth to seal it. Chris Davis: 2 for 5, 1 HR. He might have his flaws, but he’s probably the best first base option the Orioles have had in a while. Alfredo Simon: 7 IP, 4 H, 1 R, 1 BB, 3 K. That’s his best start, at least results-wise, in his short career in the rotation. 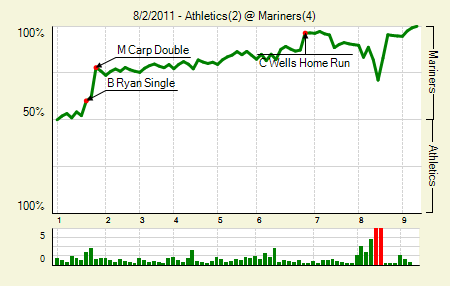 Moving the Needle: Mike Carp gets the M’s going with two in the first, +.159 WPA. The A’s didn’t get their offense going until way later in the game, and the Mariners took advantage by putting two on in the first. Carp’s double got the job done. 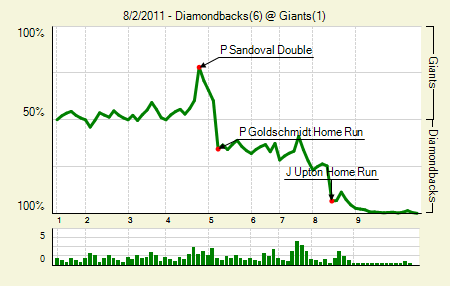 Later in the game they tacked on two more, which was nice, because the A’s got two in the seventh. But that was the extent of the scoring. Dustin Ackley: 1 for 3, 1 3B, 1 BB. I’m betting that you can go through every game he’s played this year and find something nice to say about his play, on either offense or defense, in 90 percent of them. Felix Hernandez: 6.1 IP, 5 H, 2 R, 3 BB, 9 K. You kind of expect more from Felix against the A’s, but this was still a fine start by any standard. 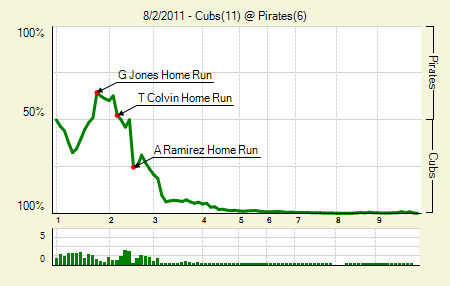 Moving the Needle: Aramis Ramirez’s three-run homer gives the Cubs an early lead, +.253 WPA. Think the Pirates feel good about not making a huge splash at the deadline? I’d say so, though the other side is that maybe if they make a move they don’t find themselves five and a half out right now. The Cubs again piled it on them last night, smacking six homers en route to scoring 11 runs. Ramirez, after putting the Cubs up 1-0 in the first, struck it big when his three-run homer gave them a 5-2 lead in the second. From there they didn’t look back. Garret Jones: 2 for 4, 2 HR. Monday it was Derrek Lee, yesterday it was Jones with two homers. Both efforts, of course, were for naught. Alfonso Soriano: 2 for 5, 2 HR. It really feels like he’s had more than two multi-homer games this year. 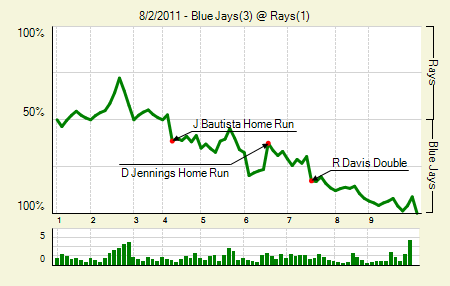 Moving the Needle: Desmond Jennings homers to bring the Rays to within one, +.141 WPA. The first rule of TMA is: the Moving the Needle section goes to the guy who induced the biggest WPA swing of the game. Here that was Jennings with a homer that made it 2-1 Toronto. But Jose Bautista’s bomb, which allowed him to keep the lead over Mark Teixeira in the AL home run race, was +.141 WPA. Either way, the game was basically decided on homers, as Bautista and Yunel Escobar hit them for Toronto. Ricky Romero: 8 IP, 1 H, 1 R, 4 BB, 7 K. That’s pretty spectacular, especially since the walks did not coincide with the homer. Rajai Davis: 2 for 4, 1 2B. He drove in an insurance run later in the game. Moving the Needle: Orlando Hudson grounds out to end the threat in the eighth, -.134 WPA. 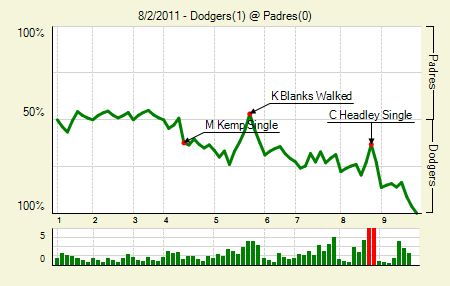 The Dodgers picked up a run in the fourth on a Matt Kemp single, but that’s all they’d get. The Padres made a couple of threats, but none as great as their first and third, two out one in the eighth. Hudson had the chance to tie with a single, but he grounded out to second and ended the inning. Mat Latos: 7 IP, 6 H, 1 R, 0 BB, 6 K. He hasn’t allowed more than three runs in his last seven starts. Though he’s seemed unspectacular at times, he’s allowed four runs just four times and five runs once. Everything else has been three or fewer. Hiroki Kuroda: 7 IP, 4 H, 0 R, 2 BB, 8 K. A contender could better use him, but it appears he’s perfectly fine playing for a non-contender. Moving the Needle: Paul Goldschmidt hits his first career homer to give the DBacks the lead, +.258 WPA. They said that Goldschmidt brought power, and he showed it in the fifth last night when he blasted a mistake pitch to deep left field. It’s definitely a homer to remember, especially since it gave the DBacks a lead en route to their win. Ladies and gentlemen, we have a tie atop the NL West. Justin Upton: 1 for 4, 1 HR. Not to be outdone by a rookie, Upton also crushed his homer, which gave the DBacks a pair of insurance runs. Daniel Hudson: 8 IP, 6 H, 1 R, 1 BB, 5 K. He had a couple of tough starts prior to this, so it’s nice to see him back on track. We hoped you liked reading The Morning After: Game Recaps for August 2nd by Joe Pawlikowski! It’s still encouraging – though your point is made stronger by the fact that these were Konerko-less White Sox. I don’t think you can ever expect 65-pitch 6 so innings. Do you watch White Sox baseball? It happens to them about 3 times a week. usually by guys who haven’t gone more than 4 innings in a couple months.